The DeAgostini Zero can be built as a carrier- or land-based version, and has a choice of construction formats. The interior can be made fully- or partly-visible, the flying surfaces can be painted or unpainted, left on or off - the options are up to you, the builder. We’d probably go for a half-and-half build, the port side exposed, starboard side covered and painted. Whichever final form your Zero takes, it’ll be a shelf-filler, with a wingspan of 750 mm (29.5 in) and fuselage length of 560 mm (22 in) - all the better to admire the detail! And detail there is, with a crisply cast aluminium airframe, and riveted panel lines. The landing gear is fully retractable, with working damped oleos and rubber tyres. 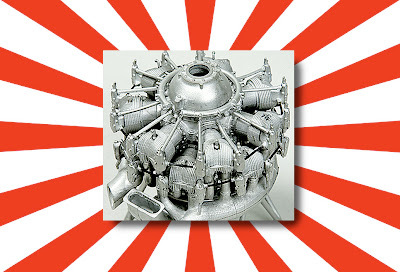 The Nakajima Sakae two-row radial engine is a work of art all by itself. It doesn’t actually fire up with a cough and a splutter, but there are many other working features, such as moving control surfaces, folding wing tips, and - a nice touch - the rotating propeller has variable-pitch blades. The DeAgostini Zero also has lighting, courtesy a selection of mini-bulbs and a battery contained within the belly fuel tank - nice! The Zero is available from ModelSpace in 25 monthly instalments, though DeAgostini points out that inexperienced modelmakers shouldn’t be put off, as there will be detailed step-by-step instructions and clear photography, plus an online forum for builders. You also get the necessary tools, assembly fittings, and a display base. Looks like a terrific kit, though how many of us could keep up the committment for more than two years is hard to guess... do you really want to see in New Year 2014 before your Zero is complete? Thought not! Perhaps DeAgostini will see the light and release it as a high-priced, but complete one-off kit. Visit the Mitsubishi Zero at DeAgostini here.